Editor's Note: This "Pirate Time Machine" feature on Pat Dye and the the accompanying sidebar were originally published exclusively in print in the 2004 edition of Bonesville Magazine. It seemed only fitting to run Ron Cherubini’s package on the East Carolina coaching legend after Dye was enshrined in the College Football Hall of Fame earlier this year for his accomplishments at ECU, Wyoming, and Auburn. This weekend, Dye will be enshrined in the East Carolina Hall of Fame, an honor that was originally going to take place in 2005 but was delayed a year to ensure that Dye could accept the honor in person. This is the first time the article, which is reproduced here with permission from Bonesville Magazine, has appeared online. As much as Steve Logan has been credited with guiding East Carolina football into the limelight of big-time, name-branded football, and as much as Ed Emory is synonymous with establishing ECU’s post-Southern Conference existence, and as much as Clarence Stasavich represented the beginning of a serious commitment to football, Pat Dye left an indelible mark on the Pirate football program. More than his gaudy record at the helm and his near-unstoppable wishbone offense, Dye shook the very foundation of collegiate football within the state of North Carolina. If the Pirates gained anything from his six seasons, it was the unabashed confidence that the small-town, low-budget school east of I-95 could not only play with their over-funded, silver-spooned brethren in Raleigh and Chapel Hill, but could beat them. And beat both, Dye did. He is the only Pirate head coach to beat the two ACC teams in his tenure. But more than what Dye meant to the Pirates, it was, perhaps, what his presence in Greenville forced the other in-state schools to do that really is the measure of his success at East Carolina. It was Dye’s method of building the Pirate program that really stirred things up in North Carolina. Dye’s focus on in-state athletes was a concept that none of the other in-state schools really paid much attention to prior to Dye’s arrival. But, they picked up on it quickly when his Pirates, largely comprised of N.C. kids, smacked the Wolfpack and the Tar Heels around a few times. Then, the ACC schools shifted focus in their own recruiting. 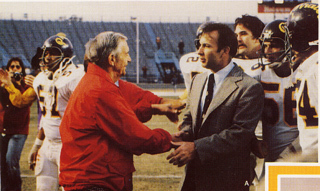 Dye, indeed, in his short tenure at ECU, won his way into the folklore of Pirates football. His record, 48-18-1, easily speaks for itself, but the greatness he went on to achieve at Auburn University only added to the affinity Pirates fans feel to this day when his name is mentioned. He is a man of deep loyalties and it when it comes to college football he has but three, in very close order: Auburn, Georgia, and East Carolina. For Auburn University, he is a devoted and tireless fund-raiser and proponent. His 99-39-4 record combined with four Southeastern Conference championships, ranks him among the greats in the SEC, and his resignation from Auburn as head coach and athletic director amid NCAA violations to this day does not diminish his reputation as an extraordinary coach. His beloved University of Georgia, where he was an all-America guard in 1960, was the school he always dreamed of attending, having grown up in Blythe, GA, right outside of Augusta. It was an easy choice for the farm-raised Dye, whose two older brothers, Wayne, Jr., and Nat, both were Bulldogs ahead of the youngest brother. And, there was East Carolina. It was the small school in Greenville that put its football future in an untested, never-before-head coach. Without ECU, Dye contends, he would never have discovered that he could be a head coach… and for that, he is forever indebted to the people of Greenville and those within the ECU family who brought him in. After Dye graduated from Georgia in 1960, he spent a few years playing linebacker in the Canadian football league. He followed up that with a two-year stint in the United States Army culminating in an honorable discharge in 1965. Then, it was back to football. He got his start by falling into the rank and file under the virtual Dali Lama of college football – Paul “Bear” Bryant. After nine years at the University of Alabama, Dye was itching for an opportunity to test himself. Having absorbed the X's and O's from one of college football’s greatest legends and having been to the pinnacle of the game itself – a national championship – he simply needed to know if he could be a head coach. It would be East Carolina who came calling… in a round about way. As he admitted, he didn’t know a whole lot about East Carolina and Greenville, but that did not dissuade him. “I didn’t know their tradition and didn’t know where Greenville was, but I knew Sonny and I knew Dr. Lowery,” Dye said. “I can’t recall everyone l met, but I remember Jack Minges and Les Garner and, of course, the A.D., Coach Stasavich. That type of talk goes a long way in Greenville, a town renowned for its collective “chip” and its shared instinct to fight the good fight. As instantly impressed as the selection committee was with Dye, he was equally impressed with the fertile football ground awaiting a coach in Greenville. And he loved the leadership. “Dr. (Leo) Jenkins was the chancellor and the football team was very, very important to him,” Dye said. “Coach Stas was from the old school and you know the first salary he offered me was less than what I was making at Alabama. Money wasn’t all that important, but when I got back home, Dr. Jenkins called and raised my salary to $24,000. I was making $22,000 at Alabama. Of course, there was the matter of breaking the news to Bear Bryant that he would be leaving the Crimson Tide staff. In perhaps a sign to Dye, the coach pointed out that Notre Dame beat the Tide 23-22 on a 100-yard kickoff return by a player named Al Hunter who had grown up in Greenville. 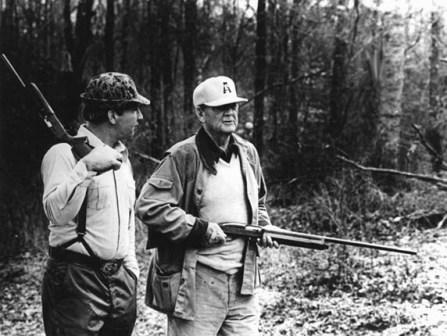 After he got back to Alabama, he broke the news to Coach Bryant in person. Dye packed his backs and headed up to Greenville ready to learn if he could be a head coach. He just wasn’t quite prepared for the difference between Alabama and East Carolina. And, for all of its deficiencies, Dye saw more in Greenville than a small program looking to grow up. “First of all, Greenville was and is as fine a place to live as anywhere in the world as far as community goes,” Dye said. “Our family was young and we absolutely loved East Carolina. Everybody in the community supported East Carolina. I had many friends who were Wake Forest, North Carolina State, North Carolina, and Duke graduates who lived in Greenville and supported our program. It was a growing opportunity for me and my staff. I made a ton of mistakes, but found out I could be a head coach. Despite working with a small budget, Dye set out to lure quality coaches to Greenville. Dye’s staff included guys like Wright Anderson, who coached running backs and Watson Brown, who looked over the quarterbacks. Then there was Jim Fuller in the offensive trench and Henry Travathan with the wide receivers. On the defensive side of the ball, Ben Grieb coached the defensive line while Frank Orgel handled linebackers and Lanny Norris worked with the defensive backs. Later, Ken Hutchinson came in to coach defensive ends as well as Neil Calloway and Wayne Hall. Also later, when Norris left the staff, Bobby Wallace came in. “They were good, young, and worked harder than anyone could have asked for,” Dye reflected. “Our coaches were also teachers. Half of the staff had to teach in the Physical Education department in order to (draw a paycheck). I taught a class myself because that was just the way it was. And these (coaches) somehow got it all done (teaching plus a coaching overload.)" And he and his staff found strength in the community. As Dye went to work learning about how to be a head coach, he realized quickly that being a head coach sometimes meant doing anything but football. “I knew I could coach, but had to prove it,” he said. “Being a head coach is a different thing. You can be an outstanding assistant and not a good head coach. You don’t know when you are there. You got to be able to coach coaches, handle the press, meet the alumni, recruit, work with the faculty, administration, and have a philosophy that is conducive to winning. There were the ancillary things that today’s ECU coaches take for granted. Dye learned quickly how to get those things by whatever means possible. Dye shares a story about one visit to a car dealer. “I asked (Bill Cain) who was the least likely car dealer in town to give us a car for the program,” Dye said. “He told me Mr. Brown. So, I went there first. (Mr. Brown) said, ‘Boy, you crazy. I’m not going to do that. You’ll tear it up.’ So, then I asked Mr. Brown, who he thought would be the next least likely car dealer to give me a car and he named the Dodge dealer. Dye wasted little time installing his Wishbone offense at East Carolina, knowing that he had to narrow the size and strength quotient. And he acknowledged that Randle left him a team with plenty to work with. A lot of the players he inherited were young and would be with his program for two or three years, giving him a fertile ground to build his program. “That team won its first three games and then lost to North Carolina State (24-20) and Appalachian State (23-21) – on a last-minute field goal – and then later in the year to Richmond (28-20), “ Dye said of his inaugural season. His team produced a 7-4 mark with notable wins coming against Southern Illinois (17-16), Bowling Green (24-6) and then-rival William & Mary (31-10). But, it was in 1975 that Dye delivered, perhaps, the win most Pirates craved, while producing an 8-3 season. While the 38-17 drubbing of the Tar Heels didn’t really factor beyond a needed win over a recruiting rival for Dye, he understood the payoff in terms of what it meant to the players… and the fans. “A lot of (my) legacy has to do with beating North Carolina State and North Carolina, it has to be,” Dye said. “Those are still big games for East Carolina. The thing that being away from it and looking back at it, you know, East Carolina doesn’t get the credit for being the great school that it is. Because they are sitting there with four other great institutions in the state – and those are four great institutions – East Carolina doesn’t always get enough credit. It was a teacher’s college and, I’m guessing, it is the age of the institution. East Carolina is the youngest one, that’s all. It is a great school. When he breaks down the 1975 season, it has less to do with beating North Carolina than it does about learning how to become a better coach through the ignorant honesty of one of his key players. “You know, we played North Carolina State and they beat us early (26-3),” he said. “Then we go and lose to Appalachian State (41-25). We won a couple of games and then lost to Richmond (17-14). We were 2-3 and I was struggling. The team was struggling and I didn’t know which way to turn. I’ll never forget as long as I live the day that Wilbur Williamson (WR, 1972-75) walked into my office before a Wednesday team meeting the week of the Citadel game. Struck by the question from a standout senior hoping to end his career with a winning record, Dye – though he didn’t realize it while in the moment – was evolving as a head coach. He was learning how to be a head coach, on the fly. Dye gathered his team together that day and relayed the discussion he and Williamson had. The story gets even more Knute Rockne-ish. “We had a great rehearsal practice on Thursday,” Dye continued. “We get ready for the bus and (Mike) Weaver has a virus and can’t go. So we go with our backup, Pete Conaty (1973-76). Pete breaks his collarbone in the second quarter and then we go to our third-teamer, Jimmy Southerland (1974-77), and we just couldn’t score. The Citadel win leveled the Pirates' record at 3-3 and was the catalyst to a fantastic 8-0 finish to the year that was highlighted not only by the 38-17 pounding of North Carolina, but also with the brutal 61-10 beating of Randle’s Virginia Cavaliers. Moreover, Dye had solidified himself as an up-and-coming collegiate head coach. His team’s Wishbone offense was gaining the reputation as a potent machine and his defensive unit finished just 10 yards shy of leading the nation in total defense in 1975. Reflecting on that season has been a regular event for Dye as he felt that it was part of a turning point in his coaching career… a tangible milestone in his evolution. 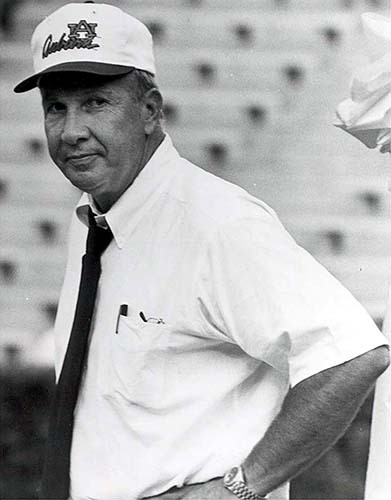 Dye’s teams went on to post winning marks each of his six seasons at the helm. In 1976, the 9-2 season was highlighted from the outset with a season opening 48-0 whipping of Southern Mississippi, followed by a 23-14 beating of North Carolina State and an eventual Southern Conference championship. The only true lowlight was a narrow 12-10 loss to UNC-Chapel Hill on a late field goal. Dye’s 1977 squad went 8-3 with highlight victories over North Carolina State (28-23) and Duke (17-16) and a narrow loss to South Carolina (19-16). In 1978, he posted a 9-3 mark, culminating with a 35-13 pasting of Louisiana Tech in the Independence Bowl. Along the way, that season, was a 45-0 blasting of Conference USA newcomer Marshall and another narrow loss to a loaded North Carolina team. The 1979 season, his last at East Carolina, ended with a 7-3-1 mark and an offensive that was tops in the nation in rushing offense at more than 300 yards a game. The team would have had eight wins had North Carolina not kicked a field goal in the closing moments of the game to tie it. But more than anything, it was something that took place off the field which marked the season. As in the 1975 season, a pivotal moment in his coaching chronology occurred, this time not so pleasant, but just as revealing. It was a lesson learned for a man who was now becoming a well-known coaching commodity. He didn’t know for sure at the time the details and opted to leave it alone for the sake of the season. His team, by the way, lost to Duke 28-14 in ’79. But after he confirmed what he already knew, he had to do what he believed was the right thing to do. “I knew I couldn’t… let me say that Dr. Bullard just wasn’t like Dr. Jenkins,” Dye said. “He started telling us how to do our jobs. Never was the same with out Dr. Jenkins. I learned that what I thought was true and I kept that in the back of my mind until the end of the season. I didn’t want it hanging over my head. We had a good year in 1979 and certainly the good times outweighed the bad. “(Dye found out for sure) on the Monday after our last ball game. I really didn’t want to know that what I suspected had happened was true because I knew if it was, I was going to have to leave East Carolina. I could have stayed and probably (made do), but I couldn’t work for some one I couldn’t trust. So, rather than trying to fight the institution – which is always more important than the individual – I thought it was best to move on. I didn’t want to damage East Carolina. I don’t regret the decision because I knew it was the right thing to do. I hated leaving those players and leaving East Carolina and Greenville. At the time, I was 40 years old and I had some good years left. I wasn’t worried about finding a job because I knew… I knew I could coach… for somebody. Dye left on principle and, as such, headed to Wyoming to take over a program that hadn’t produced a winning season in eight years. Intending to build on his first year successes – a 6-5 season – Auburn came along and threw the proverbial monkey into his wrench. His time at Auburn is well documented and despite retiring amid NCAA allegations, his stature at the university is held in high esteem. Today, Dye still works for Auburn, serving as the Special Assistant to the President and Honorary Chairman of the Capital Fund. He has an office there and reports daily. He works the alumni circuit and he is as big an Auburn fan as there is. He still keeps up with the Pirates, too. In his job, he still does the occasional speaking engagement and is always open to interviews. He used to be a regular on a syndicated radio program but gave that up after it got too tedious with other commitments. Honorary Chairman of the Capital Fund at Auburn University. Dye did say he might go back to a regular radio gig as the board that sponsored him on the Finebaum show wants to work out a new deal, though Dye added, “I’m not going to do his show as long as he is the way he is.” The board wants Dye back on because during the years he was a regular, the Monday and Friday shows were the most-listened to in the state of Alabama. He keeps himself busy with a number of endeavors, not the least of which is a publishing company and print shop. Perhaps the most valuable time to Dye these days is the time he gets to spend at his home and with his “spousal equivalent” as he endearingly refers to his girlfriend of six years. “I built me a bachelor’s house on some land in the middle of a lake,” he said of his home. “I started to keep company with a Dean in the nursing school (Dr. Nancy McDonald) at Auburn and we’ve been seeing each other since 1998. I hadn’t looked at somebody else and I’m not married. I even built her a house and attached to mine. Even gave her a ring, but we are not married. Of course, I may have to give her another ring or something down the road. I’ll tell you, it has been wonderful. She is tough as damn nails and she loves where we live. And, she has got all of her priorities in place and she helps me get mine in the right places. But the old coach would also like for those Pirates who remember his tenure at the helm to know how much East Carolina means to him. “I love East Carolina for giving me a chance and they didn’t have to,” he said. “There is not a bigger fan out there that pulls for East Carolina than I do. I’ve been back on several occasions, one when they had the 25th anniversary for the 1975 team. To see a lot of the old players and friends and to see all of the progress that has been made with the overall program was truly impressive.